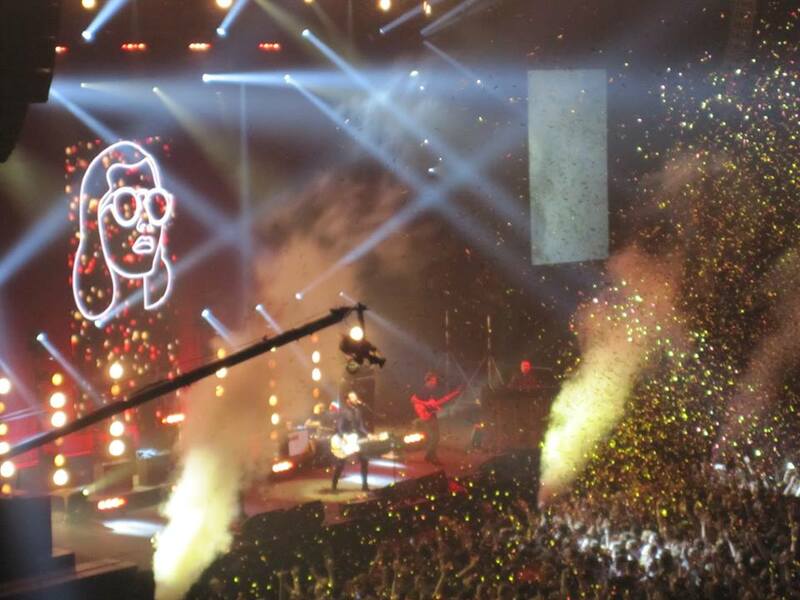 It was not all doom and gloom on Friday the 13th of December when the Courteeners made a triumphant return to their hometown with a sold-out gig at Manchester’s Phones 4u Arena. The concert was the culmination of an eight date winter tour and followed two headline performances at the city’s Castlefield Bowl earlier in the year; at which 8,000 people assembled each night to see the band perform tracks from the three albums they’ve released thus far. Prior to the gig there was a clear sense of expectation amongst fans as they made their way to the city’s largest indoor venue and they were not to be disappointed as the group cemented their place amongst Manchester’s musical elites. Opening with Are You In Love With A Notion? from the album Anna, released in January of this year, the band made it clear that the night was set to be a high energy affair. Liam Fray, the group’s lead singer, was clearly enthused by the prospect of playing to the hometown crowd, and displayed confidence reminiscent to another of Manchester’s favourite musical sons, Liam Gallagher of Oasis. The links to the city’s illustrious history did not end there though, with Please Don’t preceded by a verse from Standing Here as Fray and his bandmates paid homage to The Stone Roses. With this song, the lead singer Liam Fray made his way down to the fans who rushed towards the barrier as he led them through the track from the band’s first album, St. Jude. Having been to events at the Phones 4u previously, it’s hard to recall a time when there was such a bond between the artist and the crowd. Throughout the hour-and-three-quarters show, the band’s fans perennially chanted “Liam” as their adoration of the frontman from Middleton found its voice. The band paid back the support with a show to remember, as they rattled through twenty-two tracks in total. Van Der Graaff, That Kiss and Sycophant all stood out, whilst Take Over The World was only bettered by Not Nineteen Forever. The performance was testament to the way in which the band have developed since their days playing in small venues across the Manchester area, as the vast arena was taken over by a sea of fans there to see four local lads doing what they know best. Take Over The World marked the end of the band’s initial set, though the crowd bade for more and their wishes were answered when Fray returned to the stage alone. This reappearance was followed by a three song acoustic solo routine, which included The Rest Of The World Has Gone Home; which the band’s frontman wrote in reference to his teenage sojourns to the city’s 42nd Street night club. Following the solo encore, Fray was joined on stage once again by Daniel Moores, Michael Campbell, Mark Cuppello and Adam Payne, who serves as a member of the band for live performances. The finale was spectacular as the group played Here Come The Young Men, Not Nineteen Forever and What Took You So Long?. The band’s final track began with a snippet of Tomorrow by James, another of Manchester’s musical outputs, and ended with the release of red and gold glitter in to the air as the group capped off a staggering performance with a track that was one of their first ever singles. Prior to the finale, which served as the perfect climax to the night’s show, the band’s frontman dismissed rumours that the band planned to take a break from touring in 2014. Furthermore, Fray signalled that there may be new material from The Courteeners in the new year and thanked the fans for a memorable homecoming gig and year. As myself and thousands of other fans left the venue that night, there was a strong sense that the Manchester lads had delivered on home soil and proven their credentials as one of the city’s foremost musical groupings of the current generation. The Courteeners’ upwards trajectory shows no sign of slowing down and their future could see them selling out whole arena tours like those that have gone before them from the north-west city. A notable mention must also be made of the two support acts that performed before The Courteeners on the night. Bipolar Sunshine took to the stage first and his song Rivers was well received by the fans that had already entered the venue. Furthermore, James Skelly And The Intenders played to the crowd as they ran through several of their own songs as well as a number of well-known covers aimed at getting the audience in the mood for the main event. Previous articleJingle my bells, it's Christmas!